Hermès introduced Eau d'Orange Verte in 1979 (the original name was Eau de Cologne d'Hermès; it was renamed Eau d'Orange Verte in 1997). It was created by perfumer Francoise Caron and has notes of bergamot, lemon, mandarin, mint, jasmine, orange blossom, patchouli, moss and cedar. Eau d'Orange Verte is a citrus chypre, along the lines of Ô de Lancôme or Eau de Rochas. It starts with a slap of citrus, very sharp and acidic. The sharpness fades into a very dry orange under a heavy veil of herbal green and what smells to me like petitgrain. There is a whisper of dry florals, and a lovely mossy woods base. It is currently marketed as a unisex fragrance, but I believe it was originally introduced as a men's. When I first tried it several years ago, I thought it too masculine to wear; since then, I've become a convert. There is something very classy about Eau d'Orange Verte; like Christian Dior's Eau Sauvage or Guerlain's Vetiver, it may smell like you've borrowed it from a man's dresser, but at least you've borrowed something worth the wearing. Over the years, Hermès has introduced several variations on Eau d'Orange Verte; the only one still in production so far as I know is Concentré d'Orange Verte, a 2004 launch created by perfumer Jean Guichard. If you must have something longer lasting than the original, it is a good alternative, but as is often the case when you take a light fragrance and try to create a more concentrated version, something gets lost in the translation. In this case, it is the zesty opening: it is considerably more muted, and moves quickly into the woody dry down. The mint seems to have been amped up in compensation, so it is not a dull fragrance, it just isn't quite the same thing. Which you prefer of course depends on your taste; I'm sticking with the original. 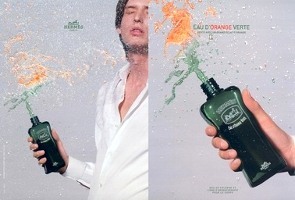 Both Eau d'Orange Verte and Concentré d'Orange Verte are widely available at department stores and online discounters. Imaginationperfumery currently has a 100 ml tester of the Eau d'Orange Verte for less than $25. I haven't tried the concentrated version, but if you say something is lost in translation then I probably shouldn't even bother. Eau d'Orange Verte is lovely as it is and last an OK amount of time on me. I LOVE this one! It is a wee bit masculine, but I enjoy the soft mix of orange and moss. Hermes sure does make some elegant fragrances! They really do! For some reason the name Hermes rarely comes to mind when I think of my favorite perfume houses, but it ought to…I love so many of their scents. Hello dear R! Great review. I went through a a couple of bottles several years ago and I still enjoy the classic smell when I get to use these as bath products in some hotels. There is a heatwave here as you know and it is perfect for hot and humid days…. Absolutely one of my favourites, algong with Sauvage (signature frag for a long time for me) & Guerlain's Vetyver. I reccomend Acqua di Parma's Arancia di Capri.as a sweeter alternative to this. If you can read this post, Robin.. then it means that the problem fixed itself, and was related to my network. Thank you for your help and sorry for the inconvenience!!!! And glad you were finally able to comment! Still don't know what the trouble is, but let me know if it happens again. Hello, I was reading this review just now (I'm only 2 years late!) Eau D'Orange Verte has always been a sort of a staple of perfumery and “hygiene” in my mind. My mother always kept a bottle of it at home for the family and I wore it in the early 80's and loved it. But it no longer interests me as a fragrance. Anyway, I just wanted to make a comment about your review to which I disagree on one particular ingredient: A huge differentiator of Eau D'Orange Verte from other “fresh colognes” is the fact that it contains ZERO bergamot (None, zip, nada!) Its citrus freshness is solely due to a particular kind of lemon that is still “green”. It is not a lime, but a lemon from the south of France called “Orange Verte” which translates from French litterally to “green orange” actually, but is a lemon not an orange. Hermes actually makes a point of it in their promotion of this nice “cologne”. Please comment. Well, you know, lists of notes are rarely accurate (and nor are the descriptions brands use to promote their own fragrances), so I don't think it's worth worrying about either way. Two years out, I can't remember where I got that particular list. The French Osmoz site lists orange, citron, mandarine for the citrus, and the English description says “A toning and sparkling fragrance, Eau d'Orange verte is a basket of citrus fruit in a bottle: oranges in all sizes, shapes and forms (leaves, fruit, blossoms), lemons with their stimulating freshness, cheering mandarins”; the Hermes site just says “citruses”; basenotes says lemon & mandarin. Personally, it is all the same to me — it smells like citrus, you know? Has anyone tried the soap?